Subdomain is a domain that is on the main domain. For example, the url of a subdomain on a main domain called domain.com will be subdomain.domain.com. A subdomain is a relative dependence of a main domain although it is not absolutely dependent on the main domain. The configuration of a subdomain is just the same as the parent domain. Whenever a visitor requests the subdomain, it will be routed to the domain name server in the parent domain. When the DNS record is resolved on the visitor’s IP address, the request is sent to the web server. The web server will then deliver the webpage of the subdomain name in the host header. Subdomain is sometimes referred as vanity domain. Subdomain is free but the main domain can be purchased from a domain reseller such as Godaddy.com. You can create as many subdomains on your website as you want. 1. 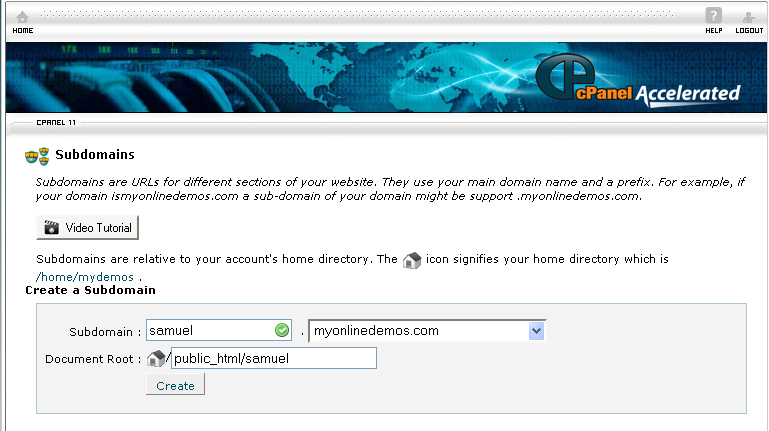 On the homepage of your cPanel, click Subdomains under “Domains”. 2. Select a domain from the drop down menu. 3. Enter a prefix for the subdomain in the Subdomain text box. You will see the subdomain you just created is now listed below. To remove a subdomain which you created, click Remove. To redirect a subdomain, click Manage Redirection. After you have entered the URL of which you want the subdomain to redirect to, click the Save button.To disable a redirection that you have set, click Disable Redirection. Uploading files to a subdomain is the same as uploading files to the root domain. You upload files to a subdomain by uploading them to rootdomain/public_html/subdomainfolder. Replace subdomainfolder with your subdomain prefix. The homepage of the subdomain must be saved as index.html.